Miami South Beach Art Deco architecture is world famous. I had the chance to spend one day in Miami South Beach on a family visit to the Gulf Coast of Florida in February. 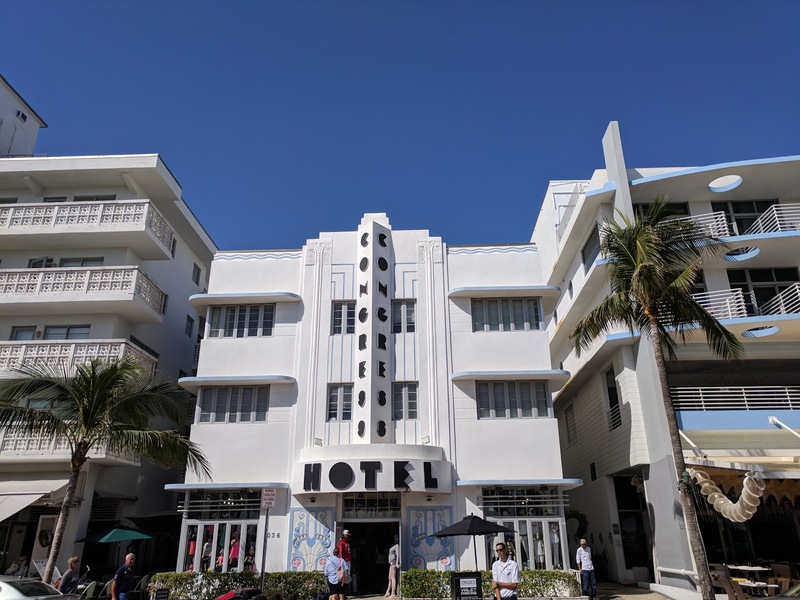 I always say that a short trip is better than no trip at all so I definitely made the most of my time in the Miami South Beach Art Deco Historic District before my flight out of Miami Airport. It's easy to fill 24 hours in Miami South Beach with fun things to do and places to eat. Read on for my recommendations for a one day visit to South Florida. When I say that I "did" the Miami South Beach Art Deco Historic District in a day, I really mean 24 hours. To truly experience Miami South Beach, you'll want to arrive at night. Check out the cool neon signage all around town. Stay in a classic Art Deco Hotel. I stayed at Hotel La Flora which was situated centrally on Collins Avenue in the heart of South Beach. The lobby featured a sparkly statue in a blue jumpsuit and Art Deco accents in the lobby including chrome chandeliers and a geometric mirror. The hotel really set the stage for my 24 hours in the Miami South Beach Art Deco Historic District. Start the day with a light breakfast at Shepherd Artisan Coffee. An iced coffee and a bagel will hit the spot. Admire that awesome Miami South Beach Art Deco architecture on your walk to the cafe. You may even spot a classic car or two to add to the ambiance. 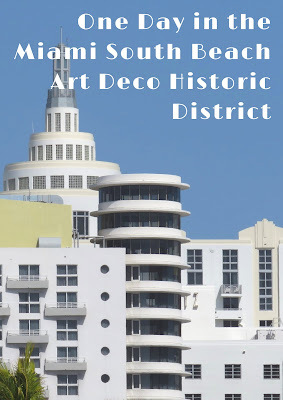 The Miami Design Preservation League (MDPL) leads a daily Art Deco walking tour departing from Miami South Beach's Art Deco Welcome Center. Tickets cost $25 USD at the time of writing for a 90 minute guided tour. Our tour guide, Joel, was incredibly knowledgeable. In fact, his collection of Art Deco televisions are on display at the Art Deco Museum in Miami South Beach. Joel retired to Miami from Brooklyn, New York and was a fount of information about South Beach, its history, and its evolving architectural style. We quickly learned how some of the original Art Deco buildings were meant to be cheap and cheerful accommodation for visiting servicemen on holiday. Joel told us that the most characteristic element of the Art Deco style in Miami South Beach was "eyebrows" above the windows to offer shade. In the era when many of these buildings were erected, there was no air-conditioning to combat that South Florida heat. What is the Art Deco style, really? Art Deco actually describes a variety of architectural styles and the term Art Deco was not in use when the buildings were originally created. 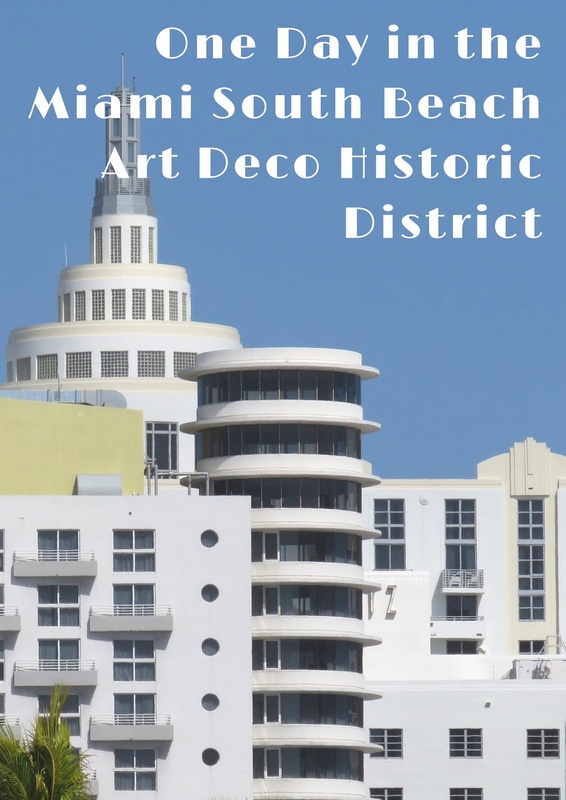 The styles include: Mediterranean Revival (1920-1935), Tropical Art Deco (1934-1950), Streamline Art Deco (1936-1950), Nautical Art Deco (1936-1950), and MiMo (Miami Modern, 1950-1965). The building above (now housing La Baguette) is an example of the MiMo style. For a time, Miami South Beach fell into decline. 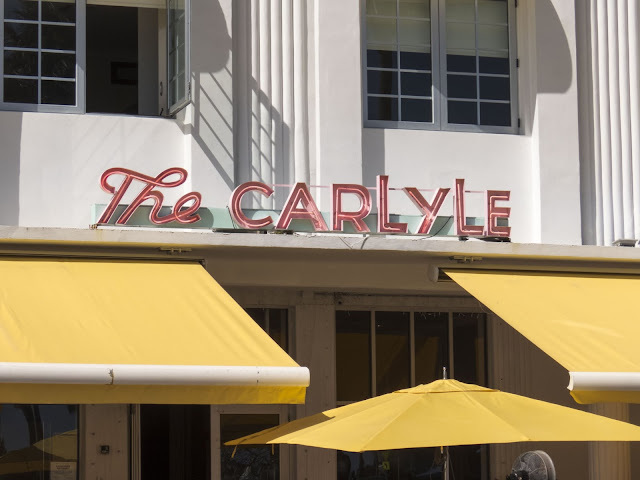 Barbara Baer Capitman is credited with saving Miami South Beach's Art Deco heritage architecture and turning things around. She bought some prominent buildings along the waterfront and turned them into mixed use bars and hotels. She showed that the enterprises could be profitable and enticed others to invest. After years of decline, Miami South Beach eventually achieved a cool resurgence. Miami Vice hit TV screens across the U.S. in the 1980s, airing from 1984 - 1990. Joel told us that Miami Vice had one of the highest costs to produce of any TV show in history but the sleek image that the show served up, thanks in part to designers like Versace, influenced what the region has become today. Did you know that Miami Vice had a color scheme and that color scheme is now prevalent all around South Beach? Bleached whites, pinks, peaches, and yellows feel right at home in the Miami South Beach Art Deco Historic District. Today, there are rules that govern what can and can't be built in Miami South Beach. The guiding principle is "compatible but not a copy". 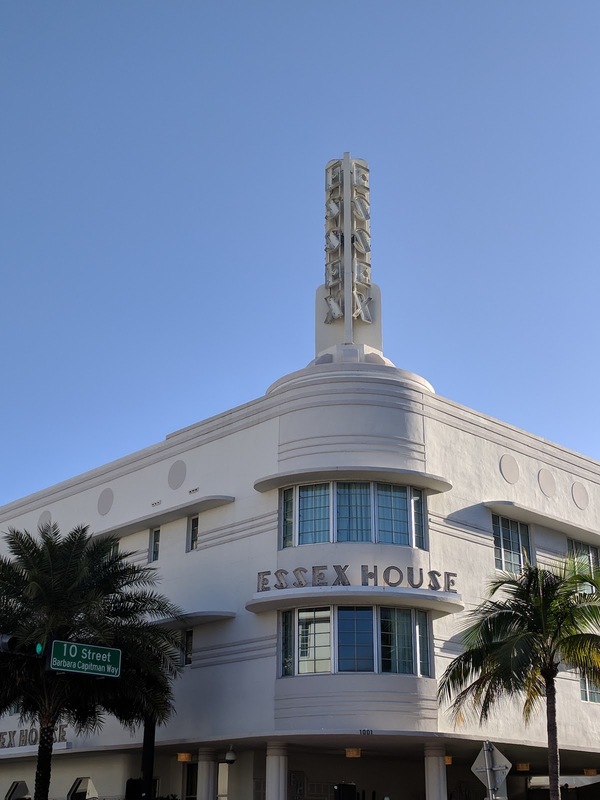 Any new buildings in the Miami South Beach Art Deco Historic District must blend in with the period originals but should not replicate the historic buildings. In this way, the architecture blends and evolves toward the future. I found this principle fascinating. I recommend trying Cuban food for lunch. There are plenty of great Cuban places to eat in Miami South Beach often run by Cuban immigrations or their descendents. I opted to try Puerto Sagua, an unassuming family-owned placed tucked away at the far end of Collins Ave. 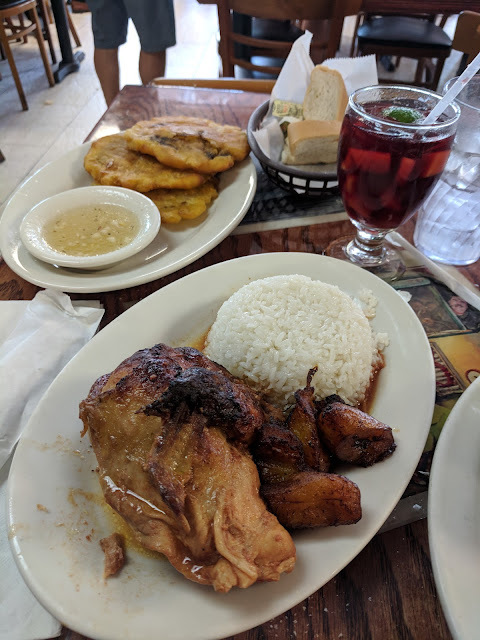 I love plantains and so ordered up roast chicken with maduras (sweet plantains) and rice. I also couldn't resist ordering a side of tostones (savory plantains that taste a bit like potatoes) washed down with a glass of sangria. Definitely go hungry. After lunch, walk off your meal on the Miami South Beach Promenade. I particularly loved the funky lifeguard stations along the water. They were definitely on-theme for the Miami South Beach Art Deco Historic District! Finish your one day in Miami South Beach with dinner on Española Way. Española Way runs for a full block and is pedestrian-only. Browse restaurants serving cuisine from all over the world. I absolutely love Cuban food so decided to do a reprise over dinner. 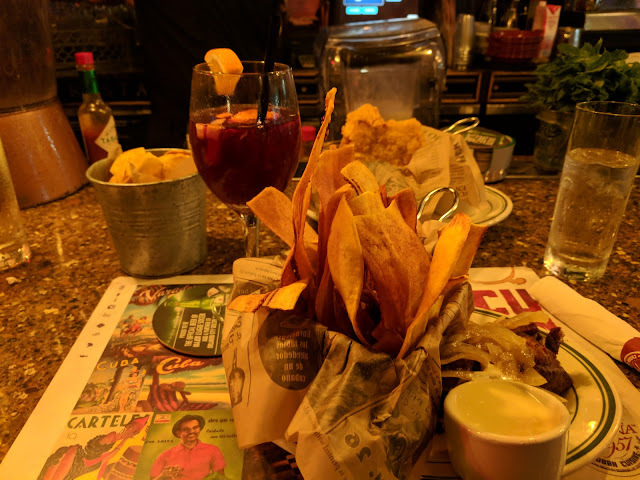 I had a small meal of appetizers, fried plantains, and sangria at the bar at Havana 1957. Española Way is really popular. Expect to wait for a table at the more popular restaurants. Havana 1957 had a long wait but I was able to short circuit most of it by agreeing to sit at the bar. I hope you've enjoyed this 24 hour tour of Miami South Beach. Whether you are an architecture buff, a foodie, or a beach person, there is something for everyone on a short trip to Miami. Read recommendations for how to spend one day in the Miami South Beach Art Deco Historic District in South Florida. Get inspiration for things to do and places to eat if you have 24 hours in Miami South Beach.